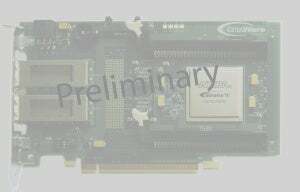 BittWare’s S5-PCIe-HQ (S5PH-Q) is a half-length PCIe x8 card based on the high-bandwidth, power-efficient Altera Stratix V GX or GS FPGA. Designed for high-end applications, the Stratix V provides a high level of system integration and flexibility for I/O, routing, and processing. BittWare’s S5PH-Q is a versatile and efficient solution for high-performance network processing, signal processing and data acquisition. Combining it with BittWare’s Anemone co-processor and ATLANTiS FrameWork enhances productivity and portability and allows even greater processing efficiency. Over 8 GBytes of on-board memory includes DDR3 and QDRII/II+. Providing additional flexibility are two front-panel QSFP+ cages for serial I/O, allowing two 40GigE interfaces (or eight 10GigE), direct to the FPGA for reduced latency, making it ideal for low-latency high frequency trading (HFT) and networking applications.